Excalibur is a name that shouldn’t be wholly unfamiliar to car guy types as it was the brand of car that sort of founded the Neoclassic movement. The original car was designed by Brooks Stevens and was a Mercedes SSK replica built for Studebaker. But Studebaker went under and Stevens set out on his own to build the Excalibur – for more than 10 years. But this isn’t the SSK replica. It should look vaguely Bugatti-ish as it was designed by Stevens and Guy Storr to resemble the Bugatti Type 35. They built a handful (27 to be exact) of these based on Opel Commodore running gear. That means it has a 2.5-liter straight-six under the hood making somewhere from 113-148 horsepower. The cars were actually assembled by Michelotti in Turin. The first Opel Commodore wasn’t introduced until 1967 and various sources list various dates for the limited production Excalibur 35X (ranging from the mid-1960s to the late-1970s but in all likelihood from 1965-1969). 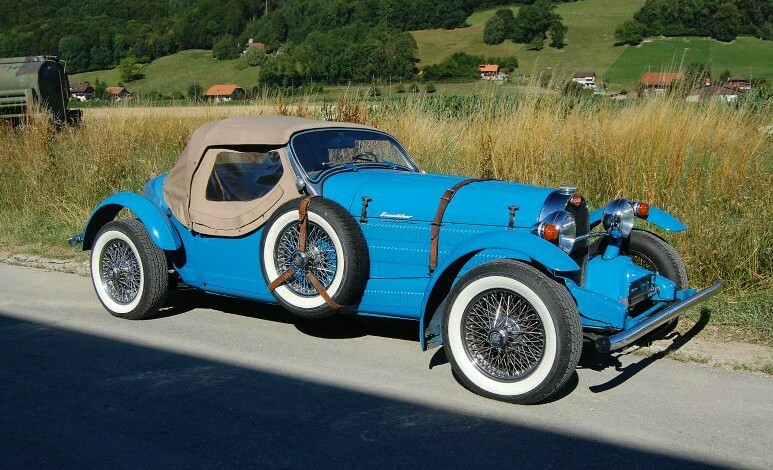 In any case, these Bugatti-esque Excaliburs are dwarfed in number by the SSK models – many more of those were built over a longer period of time. So it’s not hard to believe that there is very little info out there on these. At any rate, this is expected to bring between $65,000-$75,000 at auction. Click here for more info and here for more from this sale. This entry was posted in Uncategorized and tagged 1965, 35x, auctions, cars, classic cars, excalibur, oldtimergalerie by classiccarweekly. Bookmark the permalink.